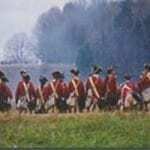 The Battle of White Plains was an inconclusive action fought on 28th October 1776 outside New York with about 4,000 men engaged on each side – the British under the command of Major General Sir William Howe, the Americans led by General George Washington. The battle came about as a result of Howe’s efforts to threaten Washington’s lines of communication, while keeping New York safe in British hands. The 28th Foot were present in Second Brigade with the 5th, 35th and 49th Regiments. “… his [Washington’s] front being everywhere covered by a deep river called the Bronx, of which every ford was defended by powerful works. At the same time he prepared another camp at White Plains, fronting to the south, so as to check the march of the British northward. Washington remained in position for a few more days, but despite his strengthening his defensive earthworks, retreated on 1st October when the British brought up reinforcements. The attack by the 28th Foot in company with the 35th provided an alternative or additional explanation of the regimental nickname of ‘the Slashers’. As they advanced towards the American position, their way was hampered by the long grass through which they marched. Using their swords and bayonets like machetes, the 28th slashed their up the slope before charging and driving the Americans from their position at bayonet point. Picture: Re-enactment of the Battle of White Plains.